Knew it led the league, but wow, Jorge Alfaro’s strikeout rate this season is 9% higher than Ryan Howard’s career rate. Higher than any season Chris Davis has had. It’s an approach that has failed more often than it’s succeeded, prompting the Phillies to acquire Wilson Ramos from the Tampa Bay Rays (for $cash$). The newest edition to the Philadelphia Zoo, “The Buffalo” has 2018 All Star on his resumé. Also on his resumé – “the good numbers”. Across the board, Ramos represents an upgrade over Alfaro. The lone field I didn’t color – BABIP, which just emphasizes how much better Ramos is. Even with a BABIP 60 points lower, his offensive numbers are unquestionably superior to Alfaro’s. Ramos backs up his offensive game with a sustainable approach at the plate (one that doesn’t involve swinging like a clock hand). Ramos swings less, makes contact more, makes better contact (as evidenced by the .300 xBA vs. Alfaro’s .224) – there’s no doubt that the Phillies improved behind the dish. Does this mean that the Phillies have given up on Alfaro? Maybe, maybe not – Alfaro is still only 25, and Ramos is a free agent at the end of the season. Until they pursue a long term replacement, Alfaro remains the catcher of the future. The fact that they pursued a short term replacement, though, means that this isn’t out of the question. Update: In Ramos’s debut with the Phillies, he hit two doubles and a triple. Welcome to Philly! Standout Hitter: Nick Williams. Wilson Ramos and Justin Bour have had great debuts, albeit in limited playing time. Limiting our scope to players with more than 10 PA, no player had a stronger week than Nick Williams. Once again, he succeeded in spite of poor plate discipline (1 BB vs. 7 K, but a .926 OPS). At this point, I think I have to concede – his power and his ability to “hit ’em where they ain’t” make up for his propensity to strike out. 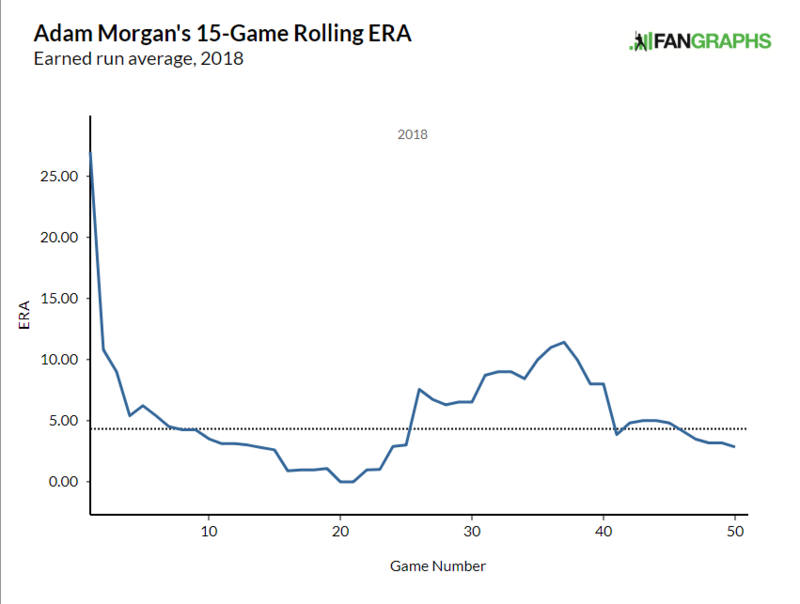 Standout Pitcher: Adam Morgan. He hasn’t always been the best pitcher this year (peep the y-axis on this graph), but this past week he’s been outstanding. His numbers were low (0.00 ERA, .188 BAA, 1.41 FIP), except where you’d want them to be high (29.4% K%, 17 TBF, 4.0 IP). Overall, he had about as good a week as you could want from a reliever, and I think that deserves some recognition. Sit-Down Hitter: Jorge Alfaro. Batting average is nice, but it isn’t everything. I’ve talked about this before, but anything that weighs a single as much as a home run should probably be taken with a grain of salt. That said, sometimes batting average will tell you all you need to know. For the past week, Alfaro hit .083. Wilson Ramos couldn’t have come off the DL at a better time. Sit-Down Pitcher: Vince Velasquez. Velasquez has had a solid season – he’s posted a good strikeout to walk ratio, and has more than halved his 2017 home run rate…but “solid” isn’t “perfect”, and on Wednesday he was far from either – 2.1 IP, 3 runs allowed. The offense and bullpen bailed him out yesterday, but with 5 games in the next 4 days, the Phillies need some long outings from starters. Otherwise, we’re going to have some very tired bullpen arms. Show me a man who doesn’t enjoy minor league antics and I’ll show you a man who hasn’t seen this. When someone starts talking about banning the shift, it sounds like this to me. Can someone please let me know what this guy is doing here? Hard mode: don’t look it up first. If you’re wondering why batters get fooled on breaking balls, watch this. Pay attention to how the balls start off following the same path before breaking in. 20-year-old rookie phenom Ronald Acuña had homered 6 times in 5 consecutive games (and 8 times in an 8-game span). Clearly this must have broken some sort of unwritten rule, because he got beaned on the first pitch of Wednesday’s game against the Marlins. Benches cleared and José Ureña, who threw the pitch, ended up getting suspended for 6 games. It’s nice to see the Phillies aren’t the only team that looks awful on the basepaths. This play by Billy Hamilton is head scratching. Part of the cause of the home run surge is also the cause of the surge in blisters. I can’t say it any better than u/tensaibaka – Monster dong, monster bat flip.